Edited to add: Mary just informed me that this is a Blue Grosbeak...thank you Mary! This sure could have been a better photo, but still considered myself lucky to get it. 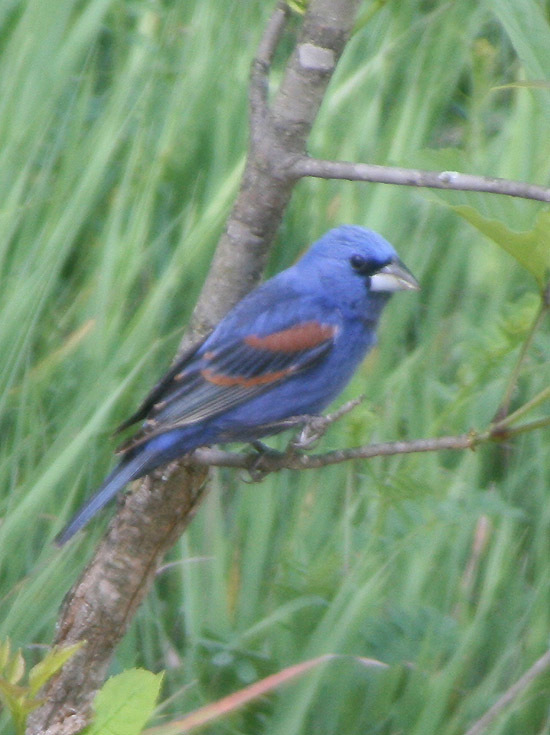 I see these indigo buntings quite often, but they usually never let me get even half way close enough to get a shot. It is another beautiful day here in the Wabash Valley....I have not got any plans set. I need to do a bit normal household chores but that is the last thing I want to do. I had rather be outside. But I will take the time to do a few things till I won't feel guilty. I wonder, does anyone else feel guilty about things they do or do not do? I feel guilty over so much stuff, and none of it really bad things. Such as I took off yesterday even and went for a little drive plus a little fishing...and got to thinking I should have stayed home and taken care of things here. But the house will need to be vacuumed the day I die...and there will probably be dirty dishes...and laundry to be done. I never feel guilty about doing fun things, and you should not. your comment about the work being there when you die is true. enjoy life and your family while you can, a little dirt does not hurt anyone. the bunting is gorgeous. never seen one. Well, I think it's a beautiful photo - I thought it was a water color painting! I think it looks great, and I agree with Montanagirl, it does look like a water color painting. We have had a couple visiting but just haven't been able to get a photo of them. I've never seen one of these buntings. You might not consider it one of your best shots but it's not bad and it documents your citing of it. Sometimes I feel guilty when there are things to be done. But, there's always something that could be done regardless. Your last sentence says it all - it will be here when we're gone so why not enjoy life and the things that make us happy while we can. That is a Blue Grosbeak! Check your bird book for photo. How nice that you have one! I didn't see Indigo buntings this year or the Rose-breasted Grosbeaks. I think they must have flown a new route that by-passsed me. Since having cancer I only care about having it clean enough to suit my hubby and myself. I believed that anyone who only wants to come visit a clean house can just stay home or clean it themselves. I now know the my life is to short and the world to large to spend all my time cooped up doing drudge work.